Beautiful townhome in a great location close to Roanoke and only minutes from stores and restaurants in Moneta and at Halesford Bridge. The main level offers an open great room which flows to the deck overlooking the lake and wooded area. Being an end unit offers much more privacy and view. Beautifully remodeled kitchen with new floors and carpet throughout. Huge HD Flat screen TV on main level, half bath off the living room, upper level has 2 bedrooms and a full bathroom. The waterside bedroom has a queen bed which allows you to wake up overlooking the water. The second bedroom upstairs has a pyramid bunk bed (twin over double) and a second twin - perfect place for the little ones! Lower level has a large recreation room with large flat screen TV, bathroom and storage room. This unit has a deeded open boat slip included for your use during your stay. If you are looking for fun, relaxation and lake water this is the perfect lake getaway. 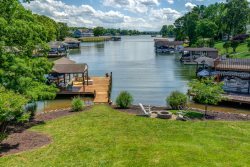 Only 30 minutes away from Roanoke this vacation spot is an oasis waiting for you at Smith Mountain Lake! Bring your family, your friends, your fishing rods and floats to relax in the surroundings of trees and lake on the dock, the deck or porch at Pat's Place town home.